A Passion for Physical Education, Health and Technology. Several theories of learning have been developed over time, however the three prominent learning theories in relation to education are behaviourism, cognitivism and constructivism, with connectivism being developed most recently due to the increase in the use of technology in education. Cognitivism is the study of the mind and how it obtains, processes, and stores information. Cognitive views on learning are associated with an information processing model which consists of several parts namely, sensory memory, working memory and long term memory, where the last two terms are part of metacognition or “the act of thinking about thinking” or “knowing about knowing”. Based on the literature metacognition is the awareness individuals have of their own mental processes and the subsequent ability to monitor, regulate, and direct themselves to a desired end. For example students demonstrate metacognition if they can articulate what strategies they used to read and understand a text. A number of teachers use the cognitive view of learning to begin lessons as elaborate rehearsal allows for information to be stored and encoded in the long term memory with constant stimuli from the environment when a person is attentive and perceptive. Attention and perception are heightened when a person is motivated which in turn allows for an increase in learning. 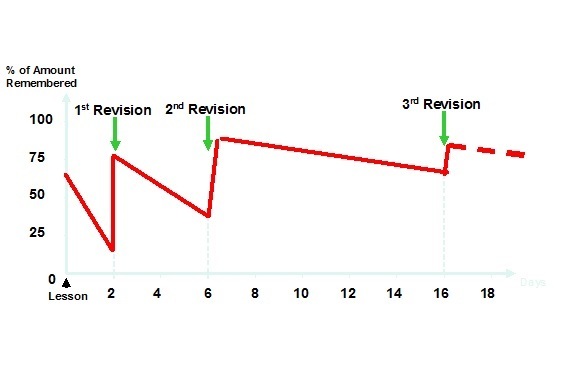 The following graph clearly demonstrates what effect revision can have on the long term memory and how much potential the brain has to store information and recall information when necessary. The brain does however lose information if the information is not continually rehearsed and encoded into the long term memory. In order to stop the brain “pruning” out information it deems is not useful it is important to make learning rewarding, enjoyable, and motivating in order for students to develop new skills and learn new information. Cognitivism is particularly relevant to the physical education setting as practicing certain skills and techniques over a period of time allows students to develop movements and eventually link them together, in order to perform the skill without thinking about it. Connectivism is a learning theory that explains how the internet and technology have created new opportunities for students to learn and share information through the internet and social networks. It is a learning theory for the digital age which emphasises the role of social and cultural context where learning is a process of connecting specialized nodes and information sources. A way in which I plan to implement connectivism in my teaching is by setting up a Wiki (A webpage in which every member of the class can edit and contribute to) for a certain topic and pose questions to the class via the wiki. Students can then research the questions in their own time and contribute to the wiki by entering and editing the answers using their name or a certain colour of text to show who has contributed. Each student will each have their own page within the wiki to post anything they feel is beneficial in relation to the question or topic. I would provide links to certain websites, videos and other learning materials and set up a class discussion area in which students can discuss questions and answers online between themselves in order to come up with the best explanation and result. This type of activity would involve constant tweaking and updating, however I believe the interaction with peers and the integration of ICT could again increase motivation and self-efficacy. Behaviourism is a theory in which learning is a process of reacting to external stimuli that cause changes in observable behaviour. The focus is on accomplishing the correct behaviour which focuses on achievable learning objectives. Positive and negative reinforcement increase the probability of the repetition of the desired behaviour. Some of the strengths of behaviourism can include the ease of application, the success of outcomes being easily measureable, helpful in behaviour modification and it can guarantee specific learning. Some critics of behaviourism have argued that behaviourism is a one dimensional approach to learning which does not account for other types of learning, free will or internal thoughts and feelings and the effect of environment in shaping the behaviour of a human. I have implemented parts of the behaviourist learning theory in the classroom by maintaining consistent routines and expectations, by providing incentives and rewards for positive behaviour as well as consequences for inappropriate behaviour. Constructivism can be described as a process in which the learner actively constructs and creates new ideas and concepts based on current and past knowledge or experience, rather than having the knowledge described to them. In other words, “learning involves constructing one’s own knowledge from one’s own experiences.” Constructivist learning, therefore, can be described as a personal endeavour as it encourages personal thinking, problem solving and self-efficacy. Constructivism involves a change in the focus of teaching and places the emphasis on the students own effort to understand. This theory opposes that of the teacher directed instruction which involves skill based learning, fixed curriculum and students working alone types of learning. There are a number of pros and cons that can be related to the constructivist learning approach. The positive aspects being a number of related factors including, interaction with peers, social, fun, group work, intrinsic motivation, use of problem solving, development of own ideas and self-efficacy. The negatives in certain situations can include time of preparation, classroom management problems, unfair assessment, and slacking off by certain students. The interactive concepts classified as pros of the constructivism theory are already widely used within the context of physical education due to the large number of team sports and necessary interaction within these team sports. The way in which I have approached constructivism in my teaching has been by posing an open ended question or topic to the students for them to elaborate on and answer or have them develop or attempt a new skill within the context of physical education, with no description of how the task or question should be approached. This allows the opportunity to develop their own knowledge on how the question should be answered or the task be performed. This approach to learning will challenge students to have their own opinions and ideas on certain topics or skills. I believe allowing students to develop their own ideas and work together in groups in some situations can increase self-efficacy and also motivation. It is important to have an understanding of the learning theories involved in education in order to understand how students learn. It is up to the teacher to decide which way they want to structure their lessons based on the year group, the ability of the students and the physical, social and intellectual development and characteristics of students. I believe that throughout a student’s schooling life they should be introduced to as many types of learning processes as possible.